CLARK COUNTY — The race to become the next chair of the Clark County Council is likely to be a close one. Incumbent Marc Boldt finished third in the August primary, meaning that he is not on the ballot for the November election. Instead, voters will get to choose between Eileen Quiring, a strongly conservative Republican who has represented the county’s 4th District since 2016, and Eric Holt, a relative political newcomer who most recently lost a bid against Sen. Ann Rivers for the state’s 18th Legislative District. Holt also served as a delegate for U.S. Senator Bernie Sanders in his presidential election bid. Quiring grew up in Clark County, graduating from Battle Ground High School before attending George Fox University. 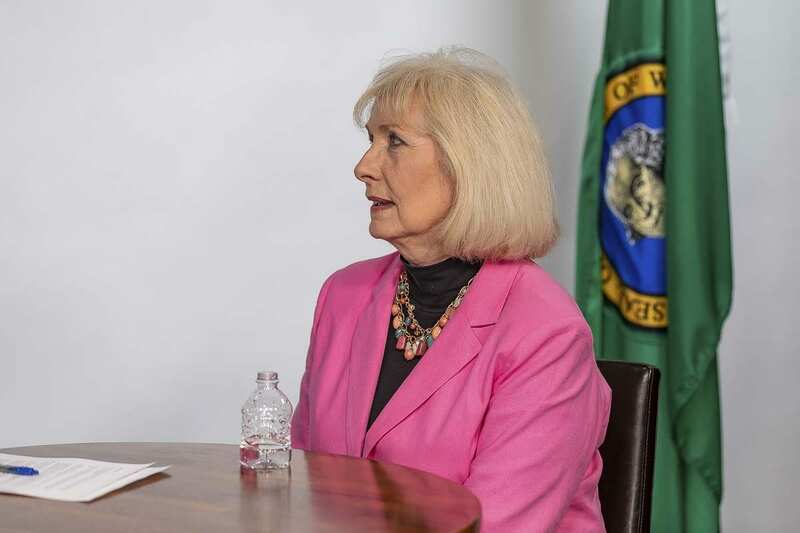 She moved to North Carolina with her then-husband, but came back to the Northwest in the early 90’s, moving to Bend, Ore. Quiring eventually served six years in the Oregon legislature, two as a state representative, and four as a senator during which she rose to the rank of majority whip. During that time she served alongside Kate Brown, then a senator and now the incumbent governor of Oregon. Quiring says if Brown is re-elected next month, she hopes their working relationship can lead to constructive conversations around the future replacement of the I-5 Bridge, especially when it comes to the controversial topic of whether light rail into Vancouver should be included as part of the project. Quiring moved back to Clark County in 2009, she says, to be closer to her daughter and other family members. In 2012, she joined the county’s Planning Commission, on which she served until being elected to the Clark County Council, 4th District position, in 2016. The county chair position is the only at-large seat in the recently adopted Home Rule Charter form of government. Quiring admits she was initially opposed to the change from a three-member commission, but has since warmed to the five-member council form of government with a stronger county manager. Quiring has a voting record that is decidedly conservative, and a penchant for saying exactly what she thinks. The position county chair speaks for the council, helps set the agenda, and needs to work well with the other council members. Quiring believes she has proven that she is open to new ideas, and willing to change her own views based on facts. She has stood staunchly against adding light rail to a new I-5 Bridge, but says she grudgingly accepts that a dedicated Bus Rapid Transit lane may be required in order to secure Federal funding for the project. Quiring was the lone no vote when the council recently decided to implement a one percent property tax increase allowed under state law. The council had declined to take the increases for several years. Quiring says revenue in the county is actually up, and she would like to see better budgeting before people are charged more. Quiring has also been an advocate for job growth and creation in the county, including support for Freight Rail Dependent industrial uses along part of the county-owned Chelatchie Prairie rail line. That plan is now on the back burner as neighbors reacted with concern, and Quiring says she’s hopeful that they can find a way to bring jobs to that area without impacting the residents’ quality of life.